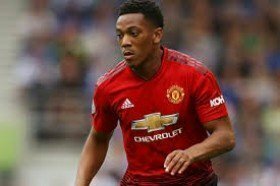 Sevilla eyeing surprise deal for Anthony Martial? Sevilla are reportedly considering an ambitious approach to sign Anthony Martial from Manchester United after failing to lure Chelsea-based striker Alvaro Morata. The La Liga side are on the search for a new centre-forward to enhance their top-four prospects and Martial has been identified as a potential option to pursue during the backend of the transfer window. According to ESPN FC, the Andalusian outfit are planning an enquiry for the France international after losing out on the services of Morata, who appears on his way to Atletico Madrid. Martial's current deal with United was scheduled to expire at the end of the season but the club have recently taken the measure to trigger the 12-month extension clause on his contract. Still, his long-term future with the club remains uncertain, although caretaker boss Ole Gunnar Solskjaer has confirmed that talks are progressing with the player regarding an extension. Martial has commanded a regular starting role since Ole took charge from Jose Mourinho last month and he should feature from the off when United take on Arsenal in the FA Cup fourth round tonight.